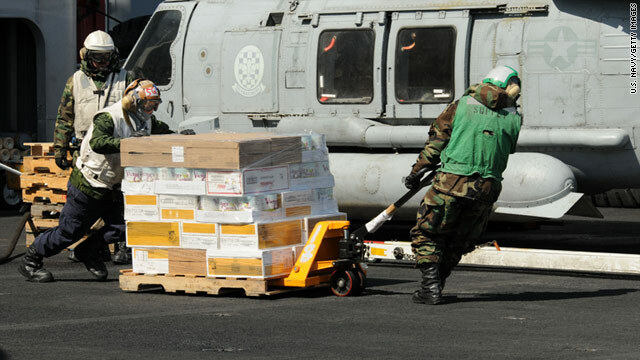 Sailors move food and other supplies across the USS Ronald Reagan's flight deck for earthquake and tsunami victims in Japan. Washington (CNN) -- The U.S. military is considering the mandatory evacuation of thousands of American troops and their families in Japan out of concern over rising radiation levels, a senior defense official tells CNN. The official, who did not want to be on the record talking about ongoing deliberations, says there are no discussions to evacuate all U.S. troops across the country. The talks have focused exclusively on U.S. troops in Yokosuka, just south of Tokyo, the official said. Yokosuka is home to America's largest naval base in Japan. The military is monitoring radiation levels on a constant basis. As of Monday, the U.S. Navy had no more warships in port at the base. The aircraft carrier USS George Washington, which had been undergoing maintenance in Yokosuka, left port Monday to get away from the plume of radioactive particles that could blow over the base. Because it left port with a much smaller than normal crew, the George Washington will not take part in the Japanese relief effort. The official said the talks originated with Pacific Command, the military authority that directly oversees U.S. troops in the region, but "discussions have since taken place here in Washington as well." The official told CNN this is strictly a contingency plan, and could be accomplished "if they needed to do it in a hurry, with gray tails," or large military transport planes like a C-17. CBS News first reported that the evacuations were being considered. A second defense official at Pacific Command, who would not go on the record for the same reason, would only say they "are monitoring the situation, and will continue to do so and keep our families informed. Prudent planning always happens." An official statement released by U.S. Pacific Command, which oversees all military operations in Asia, states that the only evacuations being performed now are under State Department guidelines, which calls for voluntary evacuations of military family members, paid for by the U.S. government. A flight carrying 154 military family members left Japan Monday, flying into Seattle/Tacoma International Airport, according to Lt. Commander Bill Lewis, a spokesman for U.S. Northern Command. That followed a flight that departed Saturday with 230 people on board. CNN's Laurie Ure and Larry Shaughnessy contributed to this report.